It's been a while since I've hung out with R and P, probably a few weeks since we've had our last Korean inspired adventure at Strathfield as we usually do! We had dinner at The Wooden Bowl initially before heading out for some dessert at the House of Pumpkin, which is right next to Noggi (that has recently shut down sadly). The exterior of the restaurant is branded with wood and barb wires, and a poorly made sign holding the words "House of Pumpkin." It didn't have a rustic, hipster vibe to it but rather a kind of dirty, old and dingy type of restaurant that was trying but just didn't try hard enough, sadly. Despite this, it was fairly packed when we went around 7:30 pm after we had our dinner. The atmosphere and service is pretty average, no very redeeming qualities about the place as it is quite a dark restaurant and all the waiters only seemed to speak Korean. 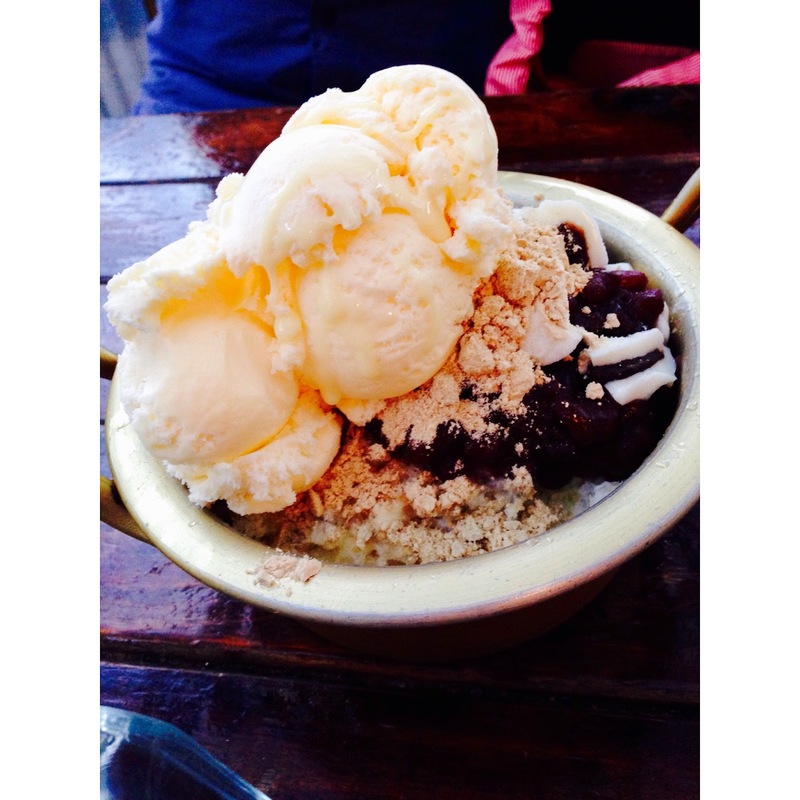 None of us has had Patbingsu before (I think), and so we were all very keen on trying some at the House of Pumpkin. Unfortunately (for me), I was hoping to find more variations in the bingsu, as I'm not a very big fan of red bean paste but there weren't any and as a result, I didn't order one for myself. Luckily, I have very generous friends that don't mind sharing and so I scabbed off them little by little. 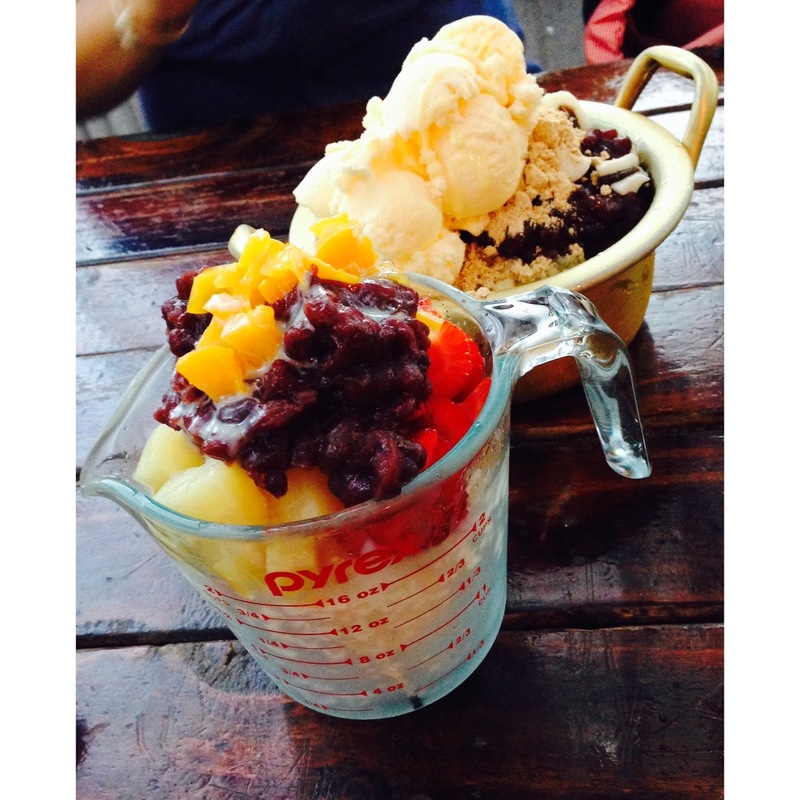 For dessert, R and P ordered the Old Boy Patbingsu (around $10), and the Small Boy Patbingsu (Around $8). There are other items on the menu other than dessert, but we wanted to go and try a different Korean restaurant for dinner and so we did! Being someone who honestly is not a very big red bean paste fan to begin with, this kind of dessert definitely did not knock my socks off or change my mind about my distaste for red bean at all. All the toppings were very warm, too warm, and I know you're meant to mix everything in before jumping in but omg why did it have to be warm?!?! Another problem was that more than half of it was filled with shaved ice, like 3/4 of it was just pure shaved ice with a drizzle of condensed milk. The shaved ice was barely even shaved, and were a lot larger in chunks that I had imagined it to be. Like tiny rocks that I had to chew through before taking another mouthful! Would of liked it 110% more if the ice was shaved much more finely like in a snow cone kind of way I guess. Although, once you do mix everything together and have every element on the spoon, it is quite refreshing and fruity (especially with the pieces of strawberry) but I probably wouldn't buy it again for myself. 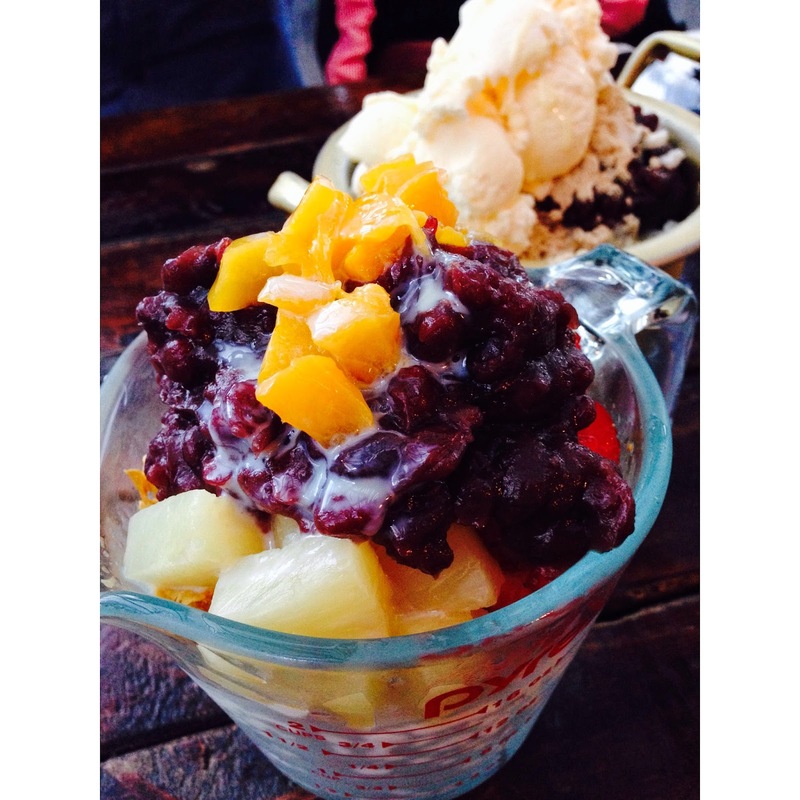 My friends enjoyed it though, as they do like red bean paste so it wasn't a problem at all and say that they'd definitely come back just for more patbingsu! The Old Boy Patbingsu had store bought Vanilla Ice cream, which was a little underwhelming but it wasn't bad so I'm not too phased by it. I was really curious about the powder though, which had a very nutty flavour, but I'm not too sure what flavour it was exactly, and these white strips that looked like coconut shavings (but weren't). When mixed altogether, the powder was probably one of the most prominent flavours, which wasn't bad at all. It was actually A LOT nicer than the Small Boy Patbingsu, and was also quite refreshing and much sweeter than the other Patbingsu, to which I enjoyed thoroughly. I was probably in denial at first, thinking to myself "nah it was probably just this one spoon that tasted nice" "Red bean paste is YUCK!" but goodness, this Old Boy sure did change my mind! It was delicious when combined altogether, and I probably would come back just for this for dessert! The only real negative I had about this was that the ice wasn't shaved as small as I would have liked it to have been, as it was just a bunch of tiny rocks in my mouth. Although, it's a pretty minor flaw that can be easily over looked, and I would definitely recommend this dessert! Overall, I probably would come back to try the other Patbingsu's (there's a coffee one that sounded pretty intriguing) and definitely for the Old Boy Patbingsu. The other menu items didn't seem to be anything out of the ordinary but I barely skimmed through them so maybe next time I might try something off their savoury menu. I've been wanting to try the melon shaved ice at Tiamo for ages now! Hopefully when the holidays come around I'll finally be able to get to it!